We all have to negotiate roads in our daily lives; we cross roads to get to the shops, our kids cross roads as they walk or ride to school, and most of us have a road outside where we live. Although they are part of everyday life they pose significant risks to our safety. Vast amounts of money are invested every year making roads as safe as possible through the considered placement of busy roads and the installation of safety infrastructure, such as barriers and pedestrian crossings. 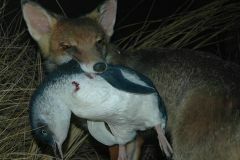 The issue is exactly the same for our wildlife moving around the landscape. Yet we currently lack comprehensive plans to make our road networks as safe as possible for wildlife. CEED researchers are addressing this gap using the power of maths to develop new planning tools for environmentally-sensitive road planning. Roads are pervasive and can invade some of the most remote places on Earth. Some consider them one of the greatest emerging threats to biodiversity. As such, roads are having significant impacts on wildlife worldwide. The most obvious threat is when individual animals are hit and killed by motor vehicles. A more subtle effect is interference that roads cause to animal migration or dispersal. But what can we do? There are essentially two ways in which these impacts can be reduced (apart from not building roads in the first place). The first is by changing where we put roads. The second is by constructing fences and overpasses. Because conservation funds are limited, choosing what to do is hard because there are so many options. Luckily we can turn to decision science to help. In two recent studies CEED has developed insights into principles for road placement and tools for prioritising mitigation structures and their locations. In both cases we used koalas for the case study. In the first study we were interested in the problem of designing whole road networks to accommodate increases in road traffic that would minimise the impact on wildlife. In doing so we considered two potential road design principles: (1) increases in vehicle numbers are accommodated through the construction of new roads, and (2) increases in vehicle numbers are accommodated through upgrades to existing roads. We applied a mathematical model that is explicit about traffic volumes and road densities to a koala population around Port Stephens on the NSW north coast. We found that in almost all cases the effect of building new roads was more detrimental to wildlife populations than upgrading existing roads. This occurred because the additional impact on animals having to cross more roads was generally much higher than the additional impact of increases in traffic volume. Our modelling also suggests that building of new roads was only preferable when the existing road network (the starting point) was of very low density, but with very high traffic volumes. This might apply, for example, for a busy highway passing through a rural area with few other roads. In the second study, we developed a new framework for prioritising among different road mitigation options (fences and crossings) that can be applied to road networks to minimise the impact on wildlife. More specifically, our framework identifies the positioning of mitigation measures, such as fences and animal passages, in such a way that the abundance of a species is maximized while taking costs into account. To test our framework we used information about a koala population located on the Koala Coast (in south east Queensland). These koalas are greatly affected by roads, with vehicle impacts representing the second highest cause of mortality for this population. We developed a population model for four patches of habitat separated by four roads with different lengths, traffic volumes and mitigation measures. We considered three possible mitigation actions for each of the four road segments: do nothing; erect fences without wildlife crossings; and erect fences with wildlife crossings. For each mitigation action combination we used the population model to predict population sizes in 100 years. We discovered that there is a strong need for mitigation as the already declining koala population will be reduced to near extinction without it. Sadly, for this case study, there was no ‘easy win’ solution where we could achieve an adequate level of conservation for a low monetary cost. We found an almost linear relationship between the benefit to koalas and cost that indicates there are no cheap solutions for this system. 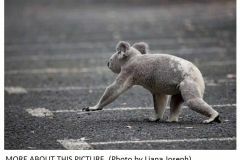 Further, if we want to maintain the local koala population we need to invest a substantial amount of resources; we estimate that an investment of 1.7 million dollars in road mitigation is essential, and this applies for an area with only 8 km of roads! One of the key challenges now is developing ways to effectively integrate the results of studies such as these into strategic planning processes for infrastructure and wildlife management.